Thai Kyowa Kako Co., Ltd. set the same standard for gas & fume treatment according to real data, real situation of gas & fume so that the exhaust gas treating system will be developed according to the problems of each user.Our engineers have specialist knowledge for gas & fume including technical knowledge to support their designing of the air pollution treatment system to run with full efficiency.When using technology for air pollution treatment system, the standard percentages of the pollution in the air have to comply with international standard. The air pollution treatment system does not only control the air pollution, it also supports for energy saving. For application of the air pollution treatment equipment from Thai Kyowa Kako Co., Ltd. to reach the most efficiency, we have to aware of. Application Fume and gas of sulfuric acid, Hydrochloric acid chromiv acid. Generation from tank surface. Up to liquid temperature of 80 ◦c Acid using place in plating , pickling and general factories. Treatment can be done by this equipment, but consult with this company about selection. Conditional application Fume and gas of caustic soda, Cyanide of soda, ammonia ,etc. Generation from tank, draft, clean bench, etc. Up to liquid temperature of 80 ◦c Plating factory, metal surface treating factory, laboratory, etc. Fume and gas of hydrogen sulfide, phosphoric acid, acetic acid ,etc. Generation from tank, draft, clean bench, etc. Fume and gas of sulfuric acid and chromate. Generation from enclosed tank, reaction tank and furnace, etc. 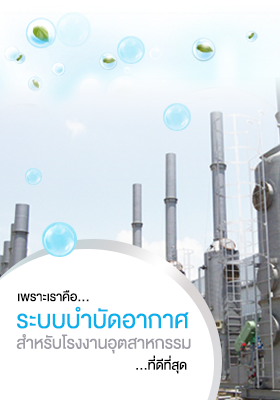 Chemical and medical factories, food factory , laboratory , etc. When rarefied nitric acid is mixed with the above gases. Generaion from tank surface.Normal temperature. Bright dip. Special subject Mixed acid gases including chlorine gas, nitric acid , nitrogen oxide and fluoric acid. Generation from draft, furnace,Tank surface,etc. Chemical factory, light metal factory , laboratory , glass industry , metal picking , etc. Consult specially with this company about these subjects.